Where is it written that seeing is believing? The recent war in Iraq (Iraq II) saw the first widespread use of live picture/phone satellite transmitted television coverage of ongoing battle, reported by camera crews “imbedded” with military units. It was shaky, it was intermittent, the sound and image broke up, and viewers all around the globe marveled at its powerful immediacy. “I’ve got to go, we’ve got incoming!” Analysts and pundits questioned the credibility of journalists under fire. Newscasters themselves seemed genuinely astonished to witness their colleagues thousands of miles, yet not even milliseconds, away. Audiences bonded with sympathetic, personable correspondents. “Dr. Gupta is performing surgery at the front!” Mass media reportage of war took huge technological and psychological leaps. Iraq II was not the first time, nor probably the last, that war and media converged to revolutionize our perception of reality. In the wake of the resultant ooohs and aaahs, and the corresponding head shaking and hand wringing, it’s perhaps prudent to take a moment to re-examine the ways that mass media and war have always converged in making history. That which a 21st Century audience accepts as real—the veracity of the immediately witnessed—is different from earlier audience realities. Since photography began, viewers have been questioning the veracity of its images. The technology and the craft of war documentary change radically in 150 years, but the questions of what to believe remain unanswered. Today, just ask if Saddam Hussein’s sons are dead or alive. Instantaneous media coverage of war began with Edward R. Murrow’s CBS radio broadcasts from London during the Nazi Blitz of 1940–41. Fittingly, they became known by his opening words, “This is London.” His radiocasts marked the first time that a vast audience of non-participants was electronically present at a military field action. In 1938, Murrow chartered a plane from London and arrived in Vienna in time to broadcast the German march into that city. He, along with colleagues William Shirer and Erik Seveareid continued on the airwaves throughout the European campaign, on location, describing WWII as they saw and experienced it. On at least one occasion Murrow broadcast from the roof of a building during an air raid, providing a first-person account of the bombardment. “Earlier this evening…Again those are explosions overhead…Earlier this evening we heard a number of bombs go sliding and slithering across to fall several blocks away.” For the listening audience political, civilian, and military, this was war with immediacy never before experienced. Simply by turning a button, war in London, Vienna or Berlin unfolded in real time for millions of listeners. Although the involvement was auditory only, it completely changed the way that people in the United States experienced the war. And like other reporting from the front before and since, it significantly changed attitudes toward U.S. involvement in wars, helping, in this instance to create a pro-war climate. Prior to Murrow, war had been brought home through writing, paintings and other mass media, though never with the immediacy of events unfolding in real time. The mists of history are haunted by mythic stories of ancient battles and heroes. In the visual realm, Napoleon glorified, as well as solidified, his drive to Empire by commissioning portraits of himself—usually triumphantly astride a horse—every time he won a significant victory. Glass plate photography was a complex and time-consuming operation, involving two photographers at the photo site. One would mix the necessary chemicals and pour them on the glass plate. After a wait for evaporation, the plate was immersed in a sensitizing bath, fitted into a holder and then inserted into the camera. The second photographer positioned and focused the camera, and when the plate was inserted, removed the lens cap for exposure. The glass plate was then transferred to a wagon darkroom for developing. Given the problems inherent in this method, Matthew Brady, with his corps of still photographers, memorialized the American Civil War (1861–1865) with remarkable depth and artistry. Photographing during the heat of skirmishes was nearly impossible. Brady’s sometimes shocking scenes of injury, suffering and devastation were generally made in the wake of battle, yet images shot this close to war were dramatic for a population that had never experienced a brutal photographic record. Distribution of Civil War photographs was limited since there was no method of reproducing wet plate images in newspapers, other than to have an artist copy them into line drawings. The 1860s battlefield pictures seen by the reading public were removed from the fighting, both physically and emotionally. It is difficult to speculate on the impact Brady’s stills had on a their audience, although contemporary reports called them shocking. In 1861 people’s expectations of the reality of war were such that carriages full of picnickers set out from the city of Washington to view the first clashes at Bull Run, only to retreat in panic and horror when they saw the true nature of the bloodshed. Brady’s photographs made clear that modern war was not an entertainment to be witnessed in person. It is almost paradoxical that the Civil War plates probably had their greatest audience impact over 100 years after they were taken when they were “re-purposed” in Ken Burns’ groundbreaking television documentary “The Civil War,” (1986) Here with Burns’ loving touch and the pans and swoops of the rostrum camera, the faces of the Civil War soldiers filled TV screens and were, in the 20th Century, charged with a presence that 1860s newspaper reproduction could never match. The images of the Civil War, like subsequent photographs from the Boer War and the Spanish-American War reached mass audiences through publication in newspapers, a process that took days if not weeks. The Boer War (1899–1901) resulted in a particular surge of one-reel films shot and processed on the battlefield and shown to avid audiences, especially in England. A 1901 issue of The Showman (a trade publication in England) recounts the efforts of one exhibitor to heighten the realism by setting off blank cartridges in the theatre. Although the cartridges cost him half a crown for 100, he claimed that the cost was worth the authenticity provided by the smell of powder and the smoky haze. Short newsreel type motion pictures of combat reached theatre audiences during the Spanish-American War (1895–1898), providing a new version of reality. Theodore Roosevelt especially, while leading the Rough Riders before he became President, loved the movie camera and it loved him. According to Albert E. Smith, co-founder and cameraman for the early film production and distribution company Vitagraph, Roosevelt displayed, “a willingness to halt his march up San Juan Hill and strike a pose.” Vitagraph’s rival Biograph sent its co- (1899–1902). There is also film footage of the Boxer Rebellion in China (1900) and the Russo-Japanese War (1904–1905). Almost all of this, like Brady’s stills is of the before and after battlefield, not combat variety, or it is staged. Smith, for instance, notes in his biography that to get shots of the combatants in action, he put British soldiers in Boer uniforms. Dickson’s Biograph equipment, lugged around South Africa in a cart, weighed over a ton. He did capture some combat shots, attached as he was to British General Sir Redvers Henry Buller’s regiment. Dickson’s departure with Buller on the ship Dunottar Castle was covered in the magazine Today with the following: “No photograph can boast the realism of the Biograph…(it) will reveal bravery as no dispatch may do, and will tell the truth in all things, owing neither loyalty to chief nor submission to esprit de corps. How far this truthfulness will please the authorities remains to be seen.” Audiences may have neither known nor cared that what was presented as combat was cast, staged, and very much edited. Whatever its authenticity, the film was seen in short snippets, in movie theatres, without synchronous sound, projected weeks or months after the events it depicted. 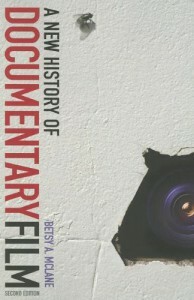 Although information about conditions of war reached the public via the most advanced then technology of the day, reality remained highly filtered by the parameters of early filmmaking. In 1913/1914, just before WWI began, the 35mm size still camera was developed, providing portability as well as the ability to print many positives from one negative. Official war photographers, using this and older technologies, were deployed by the military in reconnaissance and combat. WWI also produced some limited newsreel footage, but almost no pictures of ongoing fighting. As in earlier photographs, The Great War was seen chiefly in preparation for and during the aftermath of battle. Almost all of what people today accept as WWI battle footage was masterful restaging— albeit in actual French locations at the behest of the British government—by Hollywood director, D.W. Griffith for his melodrama “Hearts of the World“ (1918). Or was much of it actually staged in the rolling Sussex hills? Field Marshall Lord Kitchener, British Secretary of State for War, early on prohibited cinema cameras on the European battlefields. Kitchener perhaps had learned the value of spin control during his days in colonial India or commanding the 1898 Sudanese campaign. There, when he led the battle of Omdurman, reports listed 10,000 Dervishes dead, 16,000 wounded, and 5,000 captured against Empire losses of 48 dead and 382 wounded. No politically ambitious soldier would want a camera present to testify otherwise. The temptation to creatively use our mass media to capture reality continues to bedevil us today. On March 31, 2003, the Los Angeles Times published a front-page photograph from Iraq II that had, in violation of “Times” policy, been altered. The primary subject of the photo was a British soldier directing Iraqi civilians to take cover from Iraqi fire on the outskirts of Basra. After publication, it was noticed that several civilians in the background appeared twice in the single image. The photographer, Brian Walski, acknowledged that he had used his computer to combine elements of two photographs, taken moments apart, in order to improve his piece’s composition. From the staging by Biograph and military control of access, to entire computer generated worlds, the possibilities of reality technologies are irresistible to some.